For nine months Kate has lived in captivity both anxious for and dreading the day her unborn child would arrive. Now that day is here Kate realizes she would do anything at all to keep her child from falling int to Calliope's evil hands, even if it meant giving herself over to Cronus for all eternity. The only problem is that while he will spare her son, Henry and the rest of the gods will not gain the same pass. How is a mother to chose between her only child and everyone else she has ever loved? As a mother myself, I cannot even begin to express just how much this book affected me on a personal level. The raw emotions surrounding Kate and the baby were staggering, and portrayed perfectly, especially the instant connection between them. Aimee Carter really captured the range of emotions surrounding a baby, and just how far a mother would go to protect her child. Kate has to make several hard decisions throughout the book and I was incredibly impressed with her backbone. Each time one of those hard choices came about, she made up her mind, and no one, not Chronos, not the chauvinistic pig Walter, not even Henry himself was going to stop her from doing what she felt was the best thing for the people she loved. She isn't the easily swayed girl we met in the first book, and I couldn't love her any more for it. 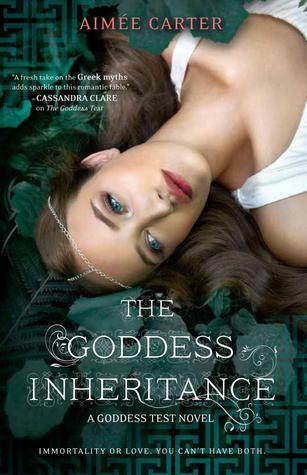 As much as I enjoyed, and was emotionally attached to, the previous books in this series, nothing could have prepared me for the emotional wreck I was while reading The Goddess Inheritance. Granted, at the start of this book, we were coming off of a killer cliffhanger and it also is the final installment so things had to come to a head. But even, so I just was not prepared for the numerous times I was literally in tears while reading this book. Don't get me wrong, this book isn't really all about doom, gloom, and sadness. In all actuality, at the core it is about holding on to hope no matter how dire the circumstances are. I've always felt that the books that really center around finding hope in the face of overwhelming odds are the books that stay with me the longest, and The Goddess Inheritance is a perfect example of this. I realize that I've mostly talked about the emotions in The Goddess Inheritance and the affect they had on me in this review. However, since I am still emotionally raw even after waiting several days to write this review, I think that shows just how impactive this book truly is. It deserves to be read unbiased and unspoiled, so I just can't in all conscience say any more, and trust me, after you read the book, you'll thank me for it. An absolutely astounding and incredible finish to the Goddess Test Series, The Goddess Inheritance is an absolute must buy as it will leave readers utterly breathless in the end.